Description: 100 Ton DC Electric Arc Melting Furnace, Manufacturer VAI – CLECIM, Year 1997 / 98. The equipment is new and still in its packing cases. 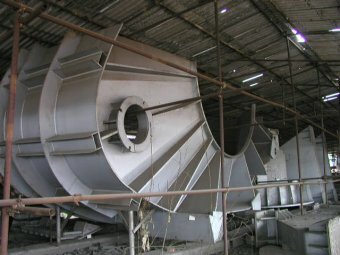 Furnace Diameter 6700mm, Transformer 90 MVA. The EAF is a DC type and is complete including transformer all power control equipment, hydraulics, cooling system, PLC's, Carbon Injection, SVC, SCR, filters etc. System is 50Hz. Complete documentation including drawings in English available. Ample spare parts and spare electrodes (700mm dia.) are included. There are new cranes and a spare furnace shell which were made in China by a V.A.I. accredited company. These are available as a package deal with the furnace. Tap to Tap Time: 65 Mins; The Roof, Panels and Cables are all water cooled.